Philadelphia attorney Bob Mongeluzzi has been called the "Master of Disasters" and the "King of Construction Accidents." He has earned those nicknames for winning some of the biggest catastrophic injury cases in the country. Editor's Note: 10 Questions is a weekly feature on NBC10.com. If you know someone who we should profile, please email us. If his name doesn't ring a bell, his courtroom fights might -- the Duck Boat disaster, the Pier 34 collapse, the Tropicana parking garage accident or the case of a man who fell into a vat of boiling water on Valentine's Day. There are many more. Philadelphia's Robert Mongeluzzi is one of the most successful personal injuries lawyers in the country. His friends call him Mongo. His peers call him "The King of Construction Accidents" or "Master of Disasters." As for the industries he goes up against, namely big business and government, here's his challenge: Put me out of business. 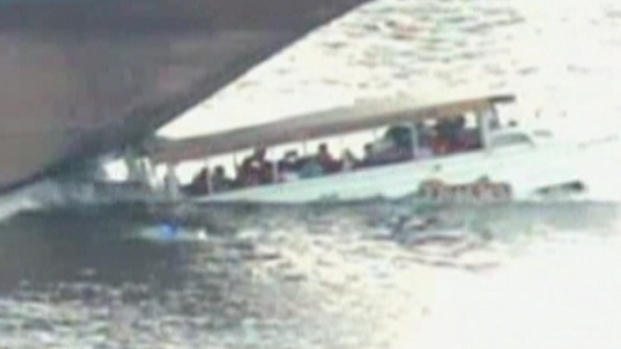 Days before trial begins in the deadly duck boat accident, lawyers for the victims' families released new video showing the crash from the Camden side of the Delaware River. 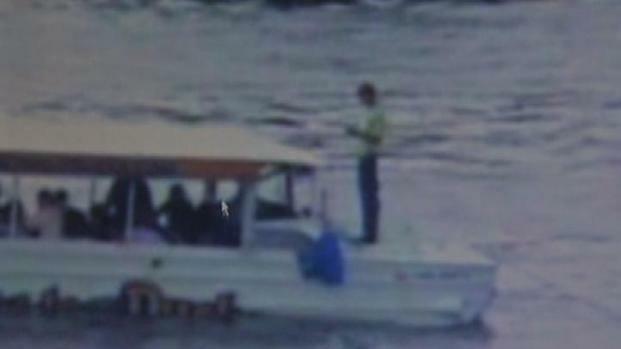 According to lawyers, the video shows the duck boat deckhand jump first, before any of the passengers. 16-year-old Dora Schwedtner and 20-year-old Sczabolcs Prem, both students visiting from Hungary, were killed in the July 2010 accident. NBC10's Rosemary Connors talked with survivor Paul Kratz who was on the duck boat at the time of the accident and showed him the video for the first time. You’re one of the most successful personal injury lawyers in the country. After more than 30 years you still love what you do. What’s your philosophy on winning? Mongeluzzi: I guess the first thing you need to do is compete. You can’t win at something that you don’t compete at and I’ve been competitive my whole life, I mean literally from when I was a toddler. I’ve always competed. I played three sports in high school – football, basketball and lacrosse. I played sprint football and lacrosse at Penn and found a lot of motivation in competition. I don’t think I could be in a job where I didn’t win or lose. I think I probably wouldn’t care. And to compete you have to both have the courage not to be afraid to lose and you need to hate to lose. You have to hate to lose. Let’s face it, everybody hates to lose, I don’t care who you are. I think I’ve lost four or five cases in thirty years, and those are the ones that stick inside, in terms of what could I have done better. What propelled you in the direction of personal injury law? In 1994, I went back to law school because Temple was having its first Masters in Trial Advocacy. They were the first law school in the United States where you could go back and learn how to be a trial lawyer. On the first day of class they said, "Stand up and give a speech about why you’re here." And I remember saying that I wasn’t really sure why I was here until two days ago. On day two of the wrongful death trial in the duck boat crash of 2010, passenger Kevin Grace told a riveting story on the stand of the last minutes and then seconds leading up to the crash. One of my clients had come in, Karen Donnelly, with her two little boys. Her husband, their father, had been killed in a construction accident. And I knew that how that case ended was going to affect those kids for the rest of their lives. Where would they grow up? What school would they go to? Would they be able to go to college? Whether I won or lost was going to impact them for the rest of their lives. And so I said, ”You want to know why I’m taking this course? I’m taking it for them.” And that may sound trite, but what we do really does affect people for the rest of their lives and changes the lives of many people. Who is or was the most influential person in your life, in terms of your career success? My dad taught me, by example, the value of hard work. He commuted from our house on suburban Long Island into New York City. He went to Manhattan every day for thirty years. And that was two hours each way and he worked on Saturdays. In terms of competitiveness, I had a legendary Hall of Fame coach at Penn by the name of “Ace” Adams who I think really brought the best out of me in terms of my competitive instincts as an athlete. He was a steely-eyed, no nonsense, authoritarian figure, which was interesting for me because I was anti-authoritarian my whole life. I mean, I protested against the Vietnam War when I was 12. He taught me the difference between fighting authority just to fight authority and fighting authority because they're wrong. Let's face it, what I do is I fight against corporations and big business and government all the time, you know, and do you do it for the right reasons or the wrong reasons? He taught me to respect the difference. The absence of your mother at an early age – you’ve talked about how your mother’s death influenced you. How did it shape the man you became? People always talk about getting knocked down and getting up, you know, whether it’s in business or on the field. You know, there’s nothing more "getting knocked down and getting up" than having one of your parents die when you’re young and being able to go on. I sort of reacted to it in the opposite direction. My mom died two weeks before I started high school. She had pancreatic cancer. I ended up being captain of the football team and all straight As and trying even harder. I think one of the reasons I can connect with a juror, with a client, is because I've felt loss and they know that when I'm communicating. It comes from a place that's real. What have you given up to get where you are today -- the price of your success? I think the price is always with your family. You know, there were many, many hours I did not spend with my kids when they were growing up, and that's because I was working. That was nights, weekends, and I think they really paid the price. I think they also understand what their dad does, but that's often the price you pay when you're driven and work hard enough to really succeed. There was an opening argument in a case that I gave of a guy who fell into a pit of boiling water on Valentine's Day. And it was the most emotional speech I've ever given and most of the jury was crying in opening. I think that's because they really connected and that's hard for someone to start telling you a story, in a courtroom, you don't know who they are and you become so involved in the story that you care enough to cry, after 30 minutes? I thought that was pretty remarkable. Uh, I think as an athlete, you can't look back although I sure as hell would love to have beaten Navy at the NCAA Playoffs in 1977. We lost by a goal. You're living a very different life probably than the way in which you grew up. When you think of success that way, what do you enjoy the most about what you have and who you are? Wow. I haven't thought about that. I guess the greatest perk is that I get really high-profile, interesting cases, that from a professional perspective you really strive to be a part of. I was co-lead counsel in the Pier 34 collapse, I was co-lead counsel in the Tropicana collapse, I was lead counsel in the Duck Boat case. When you get those types of high-profile cases and you're in the glare of publicity -- I have to tell you, when the Duck Boat case started and the judge looked down and said, "Mr. Mongeluzzi, you can open," my clients were there, all the media was there, the hordes of defense attorneys were there and the first thing that went through my mind was, "It's show time, here we go." Your advice to people who want to win at whatever it is they're doing in life? Oh, you have to pick something you care enough about and that you're passionate about. You're never gonna truly win at something that you're not passionate about. There are outliers, of course, all the time, but you know, if you're going to pour in enough of your soul to compete, and put it on the line, then you better pick something you're passionate about. What's left for you -- something big you want to accomplish? I want to revolutionize the sport of basketball by moving the baseline back 15 feet and have players be able to attack from behind the net like they do in Lacrosse. And I also want to write a play. Romeo and Juliet set in South Africa at the fall of Apartheid. West Side Story in South Africa. I just have to convince Johnny Clegg, the famous South African musician, to let me use his music. And I got to write it too!